Custom effects in a five-band setup. Multiband processor plugins are more and more fashionable these days, allowing producers to take control of dynamics, modulation, stereo width and more - band by band. 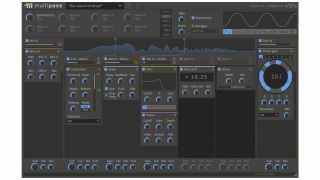 kiloHearts' forthcoming five-band processor, though, aims to give users an almost modular approach. Pipe your signal into Multipass, and you'll be able to split it into up to five frequency bands and take control over the crossover frequency for each. Instead of a fixed processor for each band (such as in a multiband compressor plugin), you get to mix and match from a pool of processors. You can also adjust basic parameters for each band - gain, panning, etc. The list of effects modules as currently planned is below, but kiloHearts are planning to add more. You should even be able to add the effects modules to the signal both pre and post splitting. Take advantage of a self-made multiband setup, meanwhile, and you could even technically tap one signal into multiple instances of Multipass, theoretically allowing access to as many processing bands as you can handle. Multipass will be an AU/VST plugin effect, and should be made available at an unspecified time in the future, but you can keep up to date with any release announcements both here and on the kiloHearts website.